AJA Video Systems has updated the Hi5-Fiber Mini-Converter with 3G-SDI support for high frame rates. It is shipping now. The Hi5-Fiber’s small size lets you attach it to easily onto the back of a monitor and extends signal reach to HDMI displays up to 10km from the source. Hi5-Fiber converts 3G-SDI over single mode optical Fiber to HDMI. Up to 8-channel embedded audio is supported in the HDMI output. It includes support for up to 16 channels of SDI embedded audio on input, a 2-channel RCA style audio output, and a USB port for configuration and status reporting when using AJA Mini-Config software. 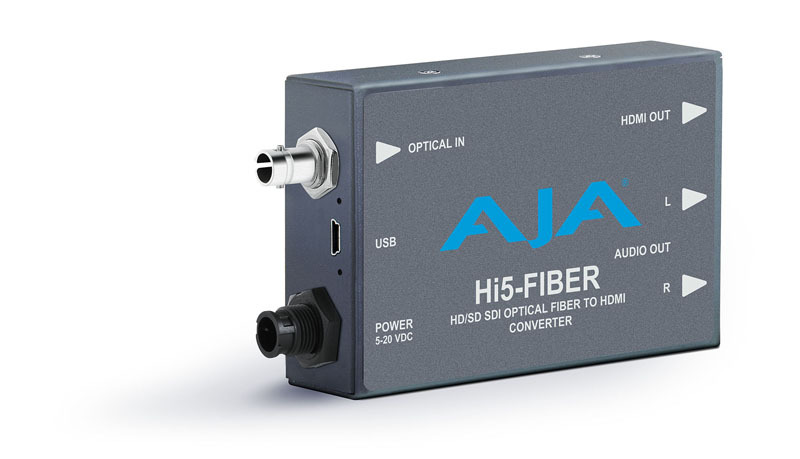 Hi5-Fiber is available now through AJA’s worldwide reseller network at a US MSRP of $695. Hi5-Fiber ships with a power supply and USB 2 cable. AJA has also released Mini-Config control software v2.17.0 with support for the redesigned Hi5-Fiber, in addition to feature enhancements for the Hi5-4K, Hi5-4K-Plus, LUT-box, ROI, ROI-DVI, ROI-HDMI, ROI-DP, and Hi5-3D Mini-Converters.